Lady Gaga joins social networking campaign for World Aids! According to gaganews.com, Lady Gaga, Justin Timberlake, Usher and other celebrities have joined a new campaign called Digital Life Sacrifice on behalf of Alicia Keys’ charity, Keep a Child Alive. The entertainers plan to sign off of social media platforms like Facebook and Twitter on Tuesday, which is World AIDS Day. The participants will sign back on when the charity raises $1 million. “I have a feeling that Gaga is going to raise it all by herself,” Leigh Blake, president and co-founder of Keep A Child Alive said. Lady Gaga has more than 7.2 million followers on Twitter, and nearly 24 million fans on Facebook. Categories Keepin' Up With The Celebrities, That's what I am talkin about!, You Can Make A Difference! The ladies VMA’s 2010 fashion, overall if I had to give it a grade it, I give it a D. There was a lot of bad fashion and even the goods had issues. Ciara was rep’n “A Town” , she looked great although I would have liked to have seen her in black shoes. I like this Lady Gaga’s outfit, everything is working but the hair, brunette would have been better. Eva Pigford’s dress was the bizness, not feeling those shoes would have rather seen her in shoes that were like the purse that was perfect. A bolder lip would have looked better and really had pulled this whole look together. The Hollywood teens need to “step it up”! The fashions @ the Teen Choice Awards were a big disappointment and we wont even discuss the boys fashion. Would someone please tell R. Pat that disheveled look he has going on is not cute. It was really hard finding the girls who had cute outfits. My 2 favorites were: Selena Gomez & Keke Palmer and I was not overly impressed with those. 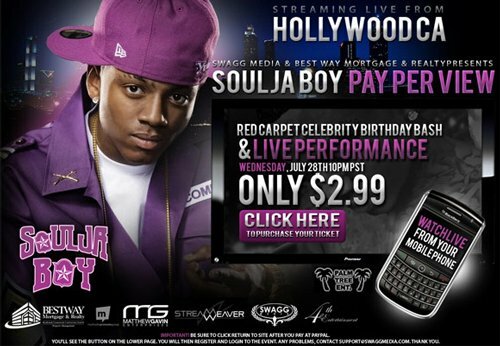 Soulja Boy turns 20 today and you can watch it live for $2.99 from your phone! Me personally am upset that I wasnt invited. There is always next year! lol HAPPY BIRTHDAY SOULJA BOY LOVE YA!